Disciples, a compilation of articles written by Fr. Overberg, points to the various facets of how discipleship is revealed. There are situations in one’s life that will define our humanity and our call as Christian. Fr. Overberg takes on real-life current topics, such as AIDS, suffering, poverty, justice, the death penalty, and shows how Christ is alive in our world. He shows how we can be Christ to the less fortunate and marginalized in our society. “Way” is a very rich term in the Bible. In the Hebrew Scriptures, it sometimes speaks of God’s will and wisdom. In the Fourth Gospel, Jesus calls himself “the Way” (John 14:4-6). Early Christianity was simply called “The Way.” Disciples helps readers appreciate what the life of discipleship—the Way—means in daily life today: call, commitment, community, challenge. 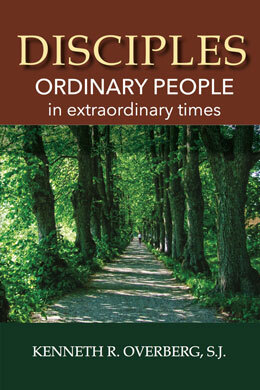 Disciples offers an excellent opportunity for prayer, discussion, and action. It is intended to enrich individuals and groups such as RCIA, St. Vincent de Paul, Just Faith, Christian Life Communities, and parish retreats. Catholic Morality… Has it Changed? HIV/AIDs: What Can We Do?